When we first came to Panama, seven years ago, we wanted to explore our new country. Our vehicles have always been 4x4s and I still wouldn’t bother buying a vehicle in Panama that didn’t have 4-wheel drive. Back then we drove all over Panama, randomly heading down dirt roads and sometimes ending up on very tough roads, but never getting stuck or lost. Inevitably when we thought we were lost, someone would come along and we would manage to get directions even without a common language. Fortunately around Boquete most roads will eventually lead back into town. Most roads in Panama aren’t marked and there are few directional signs so you really need a map, but maps, any maps, are hard to find. 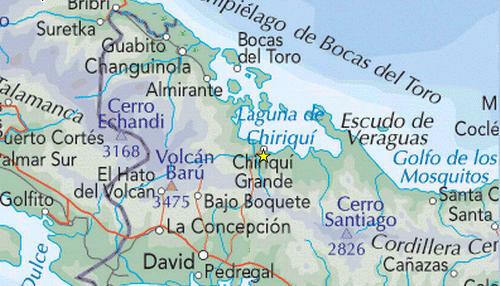 We still haven’t found a good map of Chiriqui or the area around Boquete, one that shows all the little roads. The best map we’ve found of the country is the one by National Geographic. 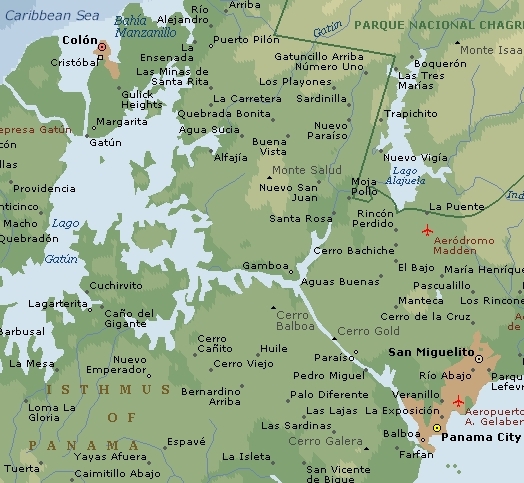 Panama Adventure Map (National Geographic Adventure Map). National Geographic’s maps are printed on heavy, moisture-resistant stock, are detailed enough to get around, and, in typical National Geographic’s style, are filled with facts and information such as . . .
BOQUETE- Settled in 1911, the town of Boquete is renowned for its pleasant climate, oranges, and festival of flowers and coffee, held in January. The western highlands contain extensive cloud rain forest. A visit includes birdwatching, hiking to waterfalls, and soaking in hot springs. 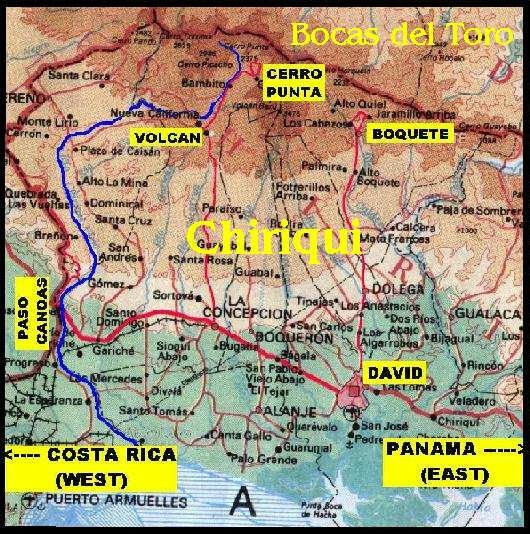 DAVID-One of Panama’s most populous cities and capital of the province of Chiriqui, David is a launching site for excursions to Boquete, Volcan Baru and islands in the Gulf of Chiriqui. It’s 10-day annual fair, San Jose International Fair, held mid-March, attracts celebrants from throughout Central America. VOLCAN BARU-The cool highlands are home to the country’s highest mountain, an 11,401-foot (3,475 m) summit. Rushing down the dormant volcano’s flank are wild rivers that draw white-water rafters and kayakers. Trout flit through sun-kissed streams. Waterfalls cascade along trails lacing rain forest. I can pour over the map almost for hours. The National Geographic Panama map map is well-worth it and if you’re thinking about moving to Panama or just visiting it is a good investment. 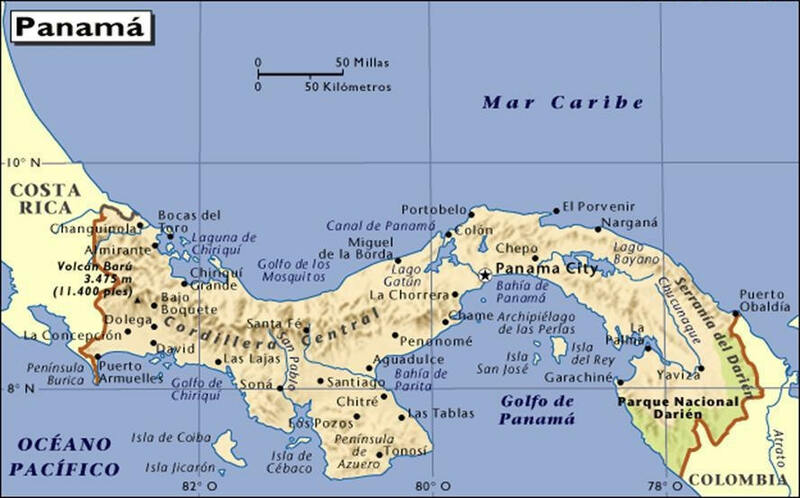 The other good map, more just a good map without all the facts, is International Travel Maps: PANAMA. The scale of this map makes it easy to read and to use. If you are in the process of “shopping” for a country in which to retire or to “escape” one of the first things you should acquire in your research is a good map! Most local bookstores can’t possibly carry a good inventory of maps, but thankfully you can shop on line. International Travel Maps has a fantastic selection of maps of almost every country. 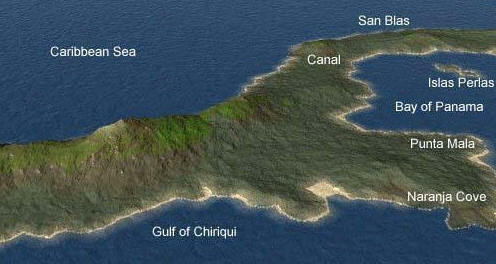 National Geographic Maps has a world of maps including wall maps, fold out maps like the one for Panama. Maps are thumbnails so just click to enlarge. Boca Chica – The star is the tiny fishing village of Boca Chica.